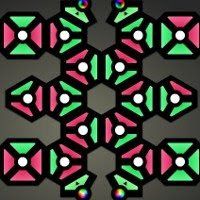 Chroma Circuit, a new puzzle game by developer Josh Tynjala of Bowler Hat Games, turns you into an “electrician of colors” who must close multi-hued circuits in order to achieve chromatic harmony. The game is broken up into three “phases,” each comprised of 6 creatively named puzzles. Each puzzle consists of a number of connected tiles with either 3 or 4 sides. Each tile “side” is associated with a particular color. In order to close a circuit and complete a level, you’ll need to rotate the tiles so that all of the adjacent sides are of the same hue. Things are fairly straightforward until you hit Phase II, when you’ll be given the power to change the color of certain tile-sides. During this phase, “input and output elements” are introduced to the circuits (indicated by multi-colored orbs). An “Input Element” changes color to correspond with its neighboring tile. “Output Elements” will change color to reflect that of the “Input Elements,” and you can simply click on either element to see where its partner is located. Aesthetically, the game sports a very clean look which is good, considering the complexity of some puzzles. The game also supports high-score functionality, which can add a bit of replay value if you want to try to improve your best time or reduce the total number of moves in a given stage. All in all, Chroma Circuit is a fun and unique puzzle game. Some of the levels might take a while to figure out, but the game never feels unfair or overly difficult. It’s well-worth a look.